The latest announcement in the Didi Chuxing security saga is that the ride-sharing app is releasing a bundle of new safety features, a staged rollout that's the reason for its late-night service outage from September 8 through 15. As well as involving some controversial measures (involuntary audio recording, read more below), the new customer service safety features are going to cost Didi a lot – the company has said it will invest 140 million RMB to be exact, according to Reuters. This after the company reportedly lost 4 billion RMB in the first six months of 2018, according to a recent report by Bloomberg. The new safety measures have been announced in the in-app update notifications, but working on the fact that nobody actually reads those, we’ve summarised the key points you need to know. Starting with the divisive, 1984-esque policy: Didi's added a new mandatory audio recording function to the driver's app. In order to continue using the app, riders need to agree (a one-time affair that's legally binding via a pop-up screen) to have the audio of your journey recorded, an agreement which includes a list of ways in which Didi will use the recordings and the situations in which it will share the recordings with third parties (mainly, to comply with 'the lawful directions of any authorities' and 'with user's request as authorized by any legal documents'). This function first appeared over this past weekend for some users. Didi says it will automatically record every ride, encrypt the audio for storage and delete it after seven days, except in the 'event of negative comments, complaints or unsettled disputes' when it will 'appropriately extend the storage time of the voice recordings'. Apparently, the purpose of the audio is to serve as evidence for driver-passenger disputes, so you can request for the recording to be reviewed when you file a complaint or give your driver a poor rating. 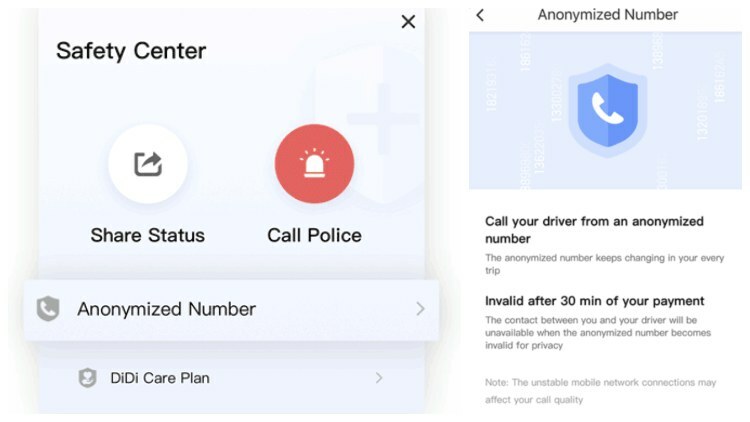 At the other end of the privacy spectrum, a new 'Safety Center' has a feature that generates anonymous phone numbers for users, allowing you to call drivers from a different number each time, so the driver doesn't actually have access to your real number. This number is then terminated 30 minutes after you’ve completed your trip payment. The driver will not be informed you are using an anonymous number. Although, how it will work if the driver calls you first or how you'd confirm the last four digits of your number if you needed to prove you're the right passenger are still tba. The Safety Center also has a much-needed upgrade of the previous 'emergency call' button. It's now a one-click police calling service that appears as a red flashing light logo next to the 'share' button in the Safety Center. The page will open up to show your car and driver information along with your current location for you to share with the police. 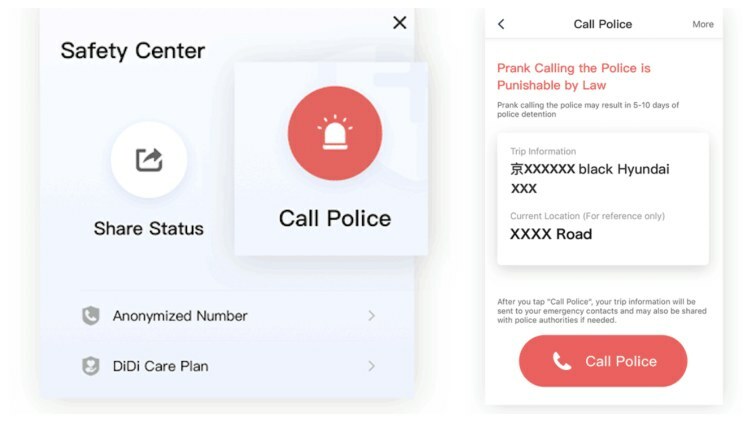 Below that is the 'call police' button which will call 110 immediately, send an SMS to your emergency contact and send your trip information to your phone with one click. And alongside these, you'll still be able to share your ride details and receive compensation through the Didi Care Plan in case of accidents and injuries. Didi is also saying that drivers will now have to undergo daily 'safety knowledge tests' and facial recognition checks before they start taking passengers.